Discover how to transform your home and your life with Mrs Hinch'Doing for household chores what Marie Kondo did for tidying. A step-by-step guide to achieving a spotless and immaculately tidy home' Daily Mirror'My new cleaning goddess' Allison Pearson, Daily Telegraph'The sensation' Sun'We're mad about Mrs Hinch' Vogue_______Cleaning - aka hinching - doesn't have to be that job you dread, not when Mrs Hinch is here to show you her sparkly ways. At over 2 million followers and counting, she has taken the nation by storm with her infectiously addictive charm, clever tidying tips and passionate belief in cleaning. 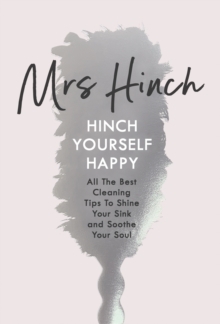 Mrs Hinch invites you into her home and while inside you'll discover how a spot of cleaning is the perfect way to cleanse the soul. She'll even share the story of Mr and Mrs Hinch and their 'dorgeous' boy, Henry. Inside you'll find out: - How cleaning can soothe anxiety and stress - Mrs Hinch's must-haves - Step-by-step guides to hinching your home - And so much more! With the help of her cloth family, Mrs Hinch will help you turn your house into a home. Whether you're a daily duster or looking for a monthly makeover, Hinch Yourself Happy shows you how to create not only a cleaner house, but a calmer you. If you want your kitchen to sparkle like Meghan Markle, then this is the book for you.